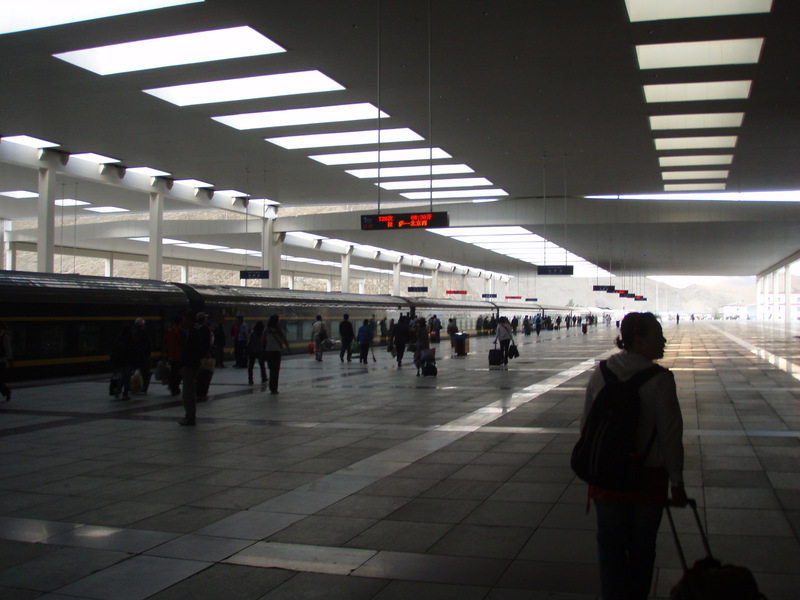 The next morning I arrived at the newly constructed Lhasa Train station and boarded the Lhasa-Beijing train, the world’s highest train and a remarkable feat of engineering. The train is completely sealed and pressurized, and in case you feel lightheaded, oxygen masks are provided…which might come in handy now that Mitori was gone. The train station is massive, but more than anything it is permanent. It is going nowhere, which is exactly what Beijing wants the Tibetans to think about the Chinese. It looks like a massive safety lock chaining Tibet to Greater China. I boarded the train and sat amongst the other passengers, almost all of them ethnic Chinese. I saw the Chinese in a different light than I had seen them while in Tibet. The soldiers who had been guarding Lhasa’s streets were now relaxed, laughing, and flirting with girls. The Chinese tourists I had so frequently criticized offered me food and made conversation. I spent most of my time watching all of China pass by my window and writing down everything you just read. I thought a lot about Tibet. This is what I have concluded for the time being. China’s claim to Tibet is essentially a historical one. Its claims of cultural and political influence stem from these centuries of interaction with Tibet. It true that Tibet has been both a vassal state and a colony of China for many years. Over those years, China’s strong culture inevitably influenced Tibet. But Tibet is a distinct culture. No one in China eats yak meat. No one in China, or anywhere else in the world, drinks yak butter tea. No Beijinger would ever wear yak-skin jackets. Mud brick houses are not seen in Shanghai. Tibetans have their own language, religion, traditions, and their own way of life that are all distinct from those of China. So the Chinese claims to China are at tenuous at best. The Chinese destroyed all the legitimacy of their rule once they decided to assert it with force. If the Tibetans are indeed Chinese, why not ask them? Beijing knows what the answer will be – a resounding NO. Instead, Chinese rule has been cemented by force. Mao tried to break Tibetan’s spirit by destroying Lhasa’s temples, but the Tibetans prevailed. The government bans pictures of the Dalai Lama, but he still offers hope to his people. Soldiers might stand on every corner, but the Tibetans are indomitable. Though they won’t admit it, the Chinese know that their rule lacks legitimacy. You can see it on the faces of the soldiers. Despite their daily propaganda, their eyes betray their doubts about the situation. Maybe they are just surprised to feel so out of place in what is supposedly part of China. If the Chinese were welcome on the streets of China they wouldn’t need soldiers on every street corner. If the Chinese version of history was correct, they wouldn’t need to jam it down the throats of every Tibetan student. But these are things the Chinese need to do, and therefore, in my opinion, they are not welcome, they are illegitimate occupiers, and they should leave Tibet immediately. The Chinese know that Tibetans have a distinct culture, which is precisely why they are attempting to dilute that culture by drowning it in a sea of Chinese settlers and tourists from around the world. The new train has forever bound Tibet to China. It is irreversible. So what does this mean for the future? Will Tibet ever be independent? In my opinion, it will not. Even the Dalai Lama has stopped asking for independence, and now asks only for autonomy. Autonomy is more realistic, but it probably won’t be granted until the Han Chinese are the majority in Tibet, once the Dalai Lama is dead and the argument is moot. It is a sad conclusion to make, but it makes me wonder if such an outcome was not inevitable. In 1950, Tibet was a small, defenseless, medieval society living in one of the most important geopolitical areas of the world. If China hadn’t taken it, India might have, therefore China took it. Britain did the same thing in 1904 only because it thought the Russians were already in Tibet. This is geopolitics. But we are not in 1904 and in this modern world we are able to communicate via mass mediums. In 1904, an average citizen would be unable to spread mass awareness about Tibet, but those of you reading this now are now a bit more aware of the situation. Mass communication is only hope for situations such as this. Spreading awareness helps, but I wish I could do more. But what am I to do? Drive to Langley, VA, and ask the CIA to ship a bunch of guns to Kathmandu so we can organize a rebellion in Tibet? The CIA already tried to intervene, and the intervention failed. This matter is now left to either Tibetans or diplomats. So for now, I spread awareness. Hopefully, one day, enough people will know about the situation and the Chinese government will be forced to bow to international opinion and remove its troops from Tibet. But regardless of what happens, one thing is certain: it will never be the same Tibet it once was, ever again.